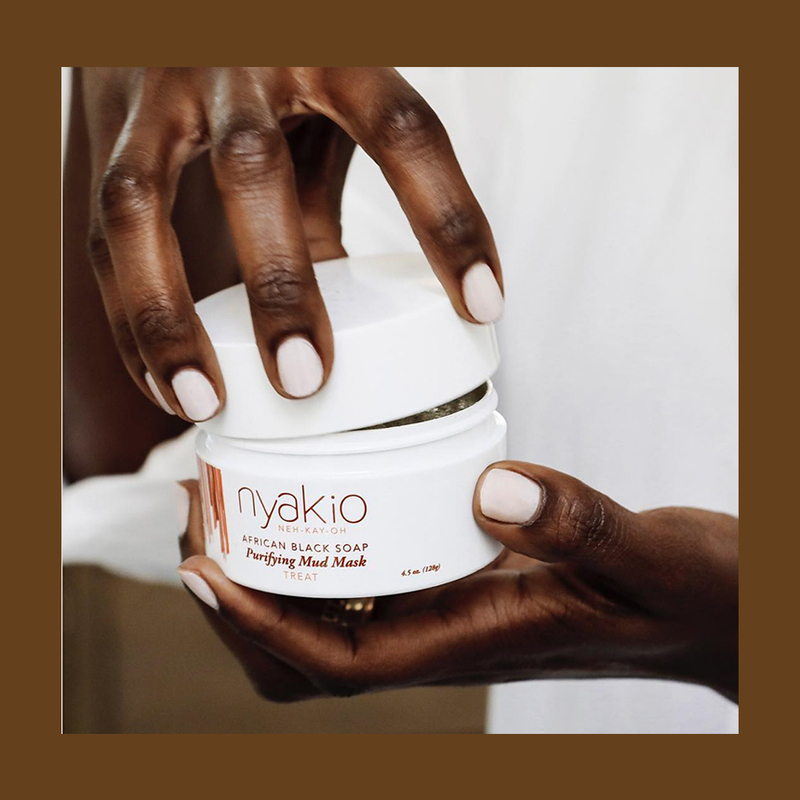 Skin, Deep: The Founder of Nyakio Beauty Says "We Need More Women of Color Entrepreneurs in the World"
I'm Nyakio Grieco, the founder of Nyakio Beauty. My beauty journey started when I was a young girl visiting my grandmother in Kenya. She was a coffee farmer who taught me to crush coffee beans and rub them on my skin using a piece of sugarcane to remove dry skin. I discovered that memories like these are shared by women around the world. When I started my journey after college, I worked in the entertainment industry, but found very quickly I was more interested in the fashion and beauty aspect. I felt many cultures were underrepresented in the world of prestige beauty, so I set out on a path to share beauty secrets with all. I was inspired and influenced not only by my namesake paternal grandmother, but also my maternal grandfather, a medicine man, who extracted oils from natural resources to treat the skin. I’ve curated beauty secrets from my family, girlfriends, and world travels and translated them into a full skincare line that utilizes ethically and sustainably sourced ingredients from around the world. Inspired by everything that’s been shared with me, I’m now sharing the best in global skincare with every woman. A friend returned from a soul searching trip to India and tipped me off to the power of Tamanu Oil. She noticed that many women appeared to have firmer, softer, and seemingly ageless skin from this “Green Gold,” used for generations in India for its reparative and skin renewing properties. It is used in the East much like aloe vera is used in the West. Highly regarded as an antioxidant and anti-inflammatory agent, the oil fades scars, stretch marks, and age spots, and relieves skin conditions such as sunburns, rashes, eczema, and psoriasis. It’s incorporated into my Tamanu Firming Face Balm, which I use not only on my face, but also my hands, cuticles, elbows, and heels. Not only do I want to celebrate my friends and family’s stories and cultural traditions that have been passed on to me, but I want to share them with the world. Restorative cold pressed oils are at the heart of the brand. The Maracuja & Yangu Soothing Oil is a skin saver that helps to alleviate dryness, irritation and redness. Additionally, I use it for cuticles, fly always, and even as highlighter or to refresh the skin over makeup. Another personal favorite is Baobab Oil, which is a main ingredient in the Baobab Youth-Infused Daily Defense Crème and Baobab Lip Balm. The baobab tree, referred to as the “African Tree of Life,” is a superfruit that helps to fight free radicals and helps to maintain skins elasticity. I am also fond of Chinese Rice. Historically women in China save their rice water, using it to brighten, condition, and nourish their skin. I love this tradition and its sustainability, and it influenced my Chinese Rice Exfoliating Cleansing Powder. As a first generation American of Kenyan decent, I learned about the power of these resourceful ingredients at an early age. Not only is it important to celebrate the benefits of global ingredients but it’s also important to maintain the integrity of sourcing which is done in an ethical, sustainable way. Natural beauty is not a trend. I think it’s very important to continue to tell these stories so that all women can benefit from natural ingredients that have stood the test of time. My beauty routine includes hydrating while I cleanse with nyakio Sweet Almond Cleansing Balm. Next, I always follow up with a face oil. Currently, I’m using nyakio Maracuja & Yangu Soothing Face Oil to help rid my skin of redness, replenish hydration after sun, and balance out my skin. I also apply the nyakio Quinoa Depuffing & Firming Eye Cream to wake up my tired eyes. I finish with Coola SPF 30 sunscreen, a little bit of Charlotte Tilbury blush, Benefit Cosmetics They’re Real! Lengthening Mascara, nyakio Baobab Lip Balm, and Smith & Cult The Queen is Dead Lip Lacer. I try to practice meditation 20 minutes a day and believe that moving your body for at least 30 minutes per day is crucial. Currently, I am really into classes at LEKfit, a dance inspired workout where I get to bounce on a trampoline like an 8 year old. I’m also a big believer in a 20 minute power nap. I have no judgements around a quick midday nap—it’s great for your mind, your body, and your skin. Never give up! And, don’t wait for the perfect time to go for it. Being an entrepreneur has risks and scary moments, but if we wait to pursue our dreams, those opportunities will pass us by. When developing your own business, stay authentic to your own story. People will believe you because it’s true. You are your own storyteller. And, remember that consumers can see right through inauthenticity. As a woman of color, I encourage all woman and especially young girls to follow your dreams. We need more women of color entrepreneurs in the world and we also have a responsibility to inspire and create opportunities within our community. I believe whole heartedly to love the skin you’re in. Beauty comes from the inside out and my skin is a reflection of my story, my heritage, and my joy. For more from Nyakio, follow her brand on Instagram and shop their products at Ulta. Newer PostDo You Really Need A Skincare Mini Fridge?